myVirtualserver - Network - Hosting inspires. Since 2018, myVirtualserver operates its servers in the highly secure data centre DUS5 in Dusseldorf (Germany). The built to Tier III + standards and ISO 27001 certified data centre has all needed features to provide quality, future proof and resilient hosting in the growing IT metropolis. The data centre has its own cogeneration plant for local power and air supply and has additional security against power outages with UPS power and power supply replacement equipment (NEA). The used technologies guarantee electricity availability of at least 99.95% in annual average. In addition, the owner has the world's largest Lampertz security room, which perfectly protects sensitive systems with vulnerable data for large customers such as banks and insurance companies from outside influences. Even cluster and blade systems with high energy and cooling requirements can operate easily on the perfectly designed surfaces. 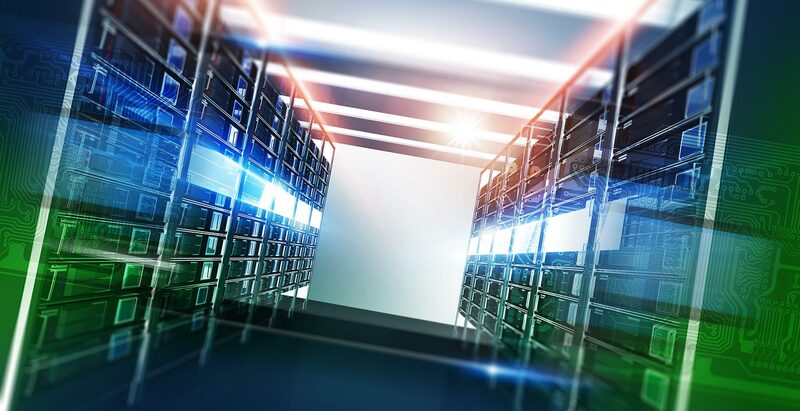 The physical security of the data centre space is a high priority. DUS5 is protected by a multi-level security system. This starts at the full perimeter of the grounds with S-wire and ends with an individual numerical code for the securing of racks and cages. Access to the data centre is only possible for authorised customers with access control. Non-authorised persons can enter the data centre only after approval by eligible customers. All relevant areas of the data centre are equipped with appropriate archiving of images with camera surveillance. All buildings are also safeguarded with a burglar alarm system; Alarms are reported both internally and at two dedicated alarm lines to independent security companies. The data centre as well as the complete location are monitored around the clock by video cameras. To ensure the security of the location of the data centre and unauthorised no indication of the location of the data centre and locations inside the data centre is given. The entire building is monitored at all times by personnel and also by an external security service which is notified of the security system. Every access of an individual in the data centre is logged in the access system with card reader. Thus, it is detectable in writing whether there are any persons in the data centre. In addition, the cages and racks of data centre are secured with a combination lock. As a result, the racks are also safe from access by access-authorised persons within the data centre. The access to the data centre can be set to meet our needs. As a result, we can determine which group of persons can gain access to our racks. Extensive measures for fire protection are in place. A highly sensitive fire alarm system monitors both the data centre and the office space. In addition to that fire detectors with suction technology which can detect fire earlier are installed in the data centre. In the event of fire, argon gas extinguishing systems now provide nondestructive extinguishing of IT and technology. Data loss by fire is not possible. The local fire department will also be informed immediately about a fire through a direct activation of the fire alarm system. All data centre surfaces correspond to at least the fire protection standard F90, surfaces in the Lampertz security room even to the standard F120. All rooms as fire section are designed to prevent the spread of fire. Inside the data centre is protected by argon gas extinguishing systems. Thus, it extinguishes the server rooms as well as the technology in the event of fire. The fire protection regulation for buildings, spaces and walls have been designed in accordance with fire resistance class F90 and F120. The fire alarm system monitors the entire building and hence the data centre and issues an immediate alarm in the event of fire. Redundant climate control systems in the data centre provide reliable cooling of the IT systems. Redundant air conditioning units provide a constant temperature between 19 and 24 degrees and a controlled humidity in accordance with the ASHRAE standards for IT. Through the use of free cooling and cold/hot aisle segregation, air conditioning working highly efficient and environmentally friendly. The entire air conditioning is monitored around the clock on the building management system and separate monitoring systems in the data centre. Leakage sensors and pressure monitoring report leaking coolant immediately. The rooms of the data centre can be cooled efficiently thanks to our cooling systems. The air conditioning systems provide up to 2 CW per m ² in the data centre. The rooms of the data centre can be cooled efficiently thanks to our cooling systems. The air conditioning systems provide up to 2 CW per m² in the data centre. The climate cabinets and recooling investments are redundantly associated with data centre, so that a 24/7 supply can be guaranteed. The separation in the cold / warm aisle system and the use of free cooling, we rely on environmentally friendly measures for cooling in our data centre. A ring-shaped connection of the medium voltage network of Stadtwerke Dusseldorf provides the own transformer equipment in data centres and in the event of failure of a power connection also ensures the power supply through the network of the energy provider. Should there still be a power supply failure, the preheated diesel generators become active immediately and update the battery-backed uninterruptible power supply existing in each data centre range. All infrastructure systems such as air conditioning, power supply systems and security systems are monitored and controlled by a building control system. A second, independent system also checks all relevant parameters and immediately informs our technicians and service providers in the event of a fault. A ring-shaped connection of the medium voltage network of Stadtwerke Dusseldorf provides the own transformer facilities of data centre. The data centre surfaces will receive up to 10 kW power cable per square meter. This equips the data centre with sufficient power. If there is a power outage, our ups and power supply replacement equipment kick in and provide the data centre, in the event of disconnection, with continued power. The UPS and power supply replacement equipment ensures a sufficient supply of diesel fuel to continue to deliver power in major outages of the energy provider. The cables of the power supply are duplicated, so also if damaged they can still provide the data centre with all needed energy. The complete power supply is monitored around the clock. Should there be problems, the appropriate technician will be notified immediately.